Beware of the opal bug! It is a close kin to the love bug and, once bitten, there is no escape. bright play-of-color. It also has a truly black background color. With the world’s primary supply of black and boulder opal coming from its wild outback, Australia is synonymous with opal. Since the first recorded discovery of precious opal in the 1840s, its fabulous play-of-color has delivered excitement and delight to consumers all over the world. In May 2015 GIA sent a group of field gemologists to the southern hemisphere to explore some famous opal fields, where they were impressed by the tenacious optimism of the miners and learned extensively about this breathtaking gemstone. The team included GIA field gemologists Vincent Pardieu and Andrew Lucas, G&G technical editor Tao Hsu, assistant field gemologist Victoria Raynaud, and field cameramen Didier Gruel and Didier Barriere Doleac. Between latitudes 22° and 31° South, and extending from longitude 145.30° across the Queensland and South Australian boundaries into the heart of the interior desert land, stretches a tract of country which presents many strange problems to explorers and others interested in the study of the earth’s formation. The opal journey started at Lightning Ridge, New South Wales, the household name for black opal. In Lightning Ridge the team met multiple opal miners, cutters, and researchers who shared their techniques, experience, and passion for the opal industry. The authors also visited many characteristic opal shops and looked at the finished loose stones and jewelry pieces. Then we headed northwest to visit boulder opal fields. We spent one full day in each of the following fields: Koroit, Yowah, and Quilpie. Both open-pit and underground mines were covered by the team. (Please note that the Australian miners refer to open-pit operations as open-cut operations, which is reflected in the upcoming videos of the miners.) Finished boulder opal products were checked and recorded as well. Famous opal fields such as White Cliffs, Andamooka, and Coober Pedy along the southern and southwestern margin of the Great Artesian Basin were not covered in this trip. More detailed information about each location the GIA group visited will be provided in following Australian opal series articles. Australian opal is predominantly found in sedimentary rocks within the Great Artesian Basin. The Great Artesian Basin is the largest artesian basin on this planet and the main “water tank” that supplies inland Australia. The basin is the remnant of an inland sea filled with sediments. Some volcanic opals have been recovered, but production is very limited compared to sedimentary opal. Although the chemistry and the microscopic structure of opal have been well analyzed, the formation of this gemstone is still much debated within the research field. Multiple models have been published with supportive evidence to demonstrate how opal formed. One certainty is that not all opal formed in the same way. Supply and transportation of silica, space for growth, sedimentation conditions, and ion exchange processes are some critical questions to be answered before any definitive model is constructed. During this visit we also found that although these opal fields have many things in common, such as Jurassic- and Cretaceous-period sedimentary host rocks, each one has its own characteristics. Our first stop is Lightning Ridge, synonymous in the gem industry with top-quality black opal. The town is located in northern New South Wales and close to the border between New South Wales and Queensland. Geologically, Lightning Ridge is situated in the Surat Basin, part of the Great Artesian Basin. The sedimentary host rocks are more or less horizontal with no deformation. Black opal occurs as nobbies and as seams. The stones are generally found between 6 to 18 meters below the surface. Also amazing in this field are the extraordinary opal fossils of the Cretaceous age. These fossils are considered a national treasure and are well preserved in the Australian Opal Centre for both exhibition and paleontological research. Known for its rich history of black opal mining, mineral water spas, and unique Australian outback lifestyle, Lightning Ridge has long been a tourism hot spot, with more than 90,000 visitors per year. To the northwest of Lightning Ridge are the Queensland boulder opal fields. Boulder opal from Queensland has very bright play-of-color, which makes these stones extremely appealing. The stone is called boulder opal because it is always attached to its host ironstone. Though the sedimentary host rocks are very similar to those in Lightning Ridge, the opal occurs mainly in ironstone concretions or as pipes instead of nobbies. Seam opal can sometimes be found in Queensland fields. Though local miners give the ironstone concretions different nicknames, such as “nuts” or “lily pads,” based on their different shapes, they bear the same concentric internal structure. Opal can be found as the kernel of the “nuts,” between the concentric layers of ironstone or on the surface of the concretions. Certain opalized fossils were also recorded in this area, with plant fossils commonly seen. There are more than a dozen boulder opal fields in Queensland; the GIA team visited Koroit, Yowah, and Quilpie. The Koroit opal field was first discovered in 1897, and the most recent mining activities started in 1972, when consumers regained interest in boulder opal and sales became more profitable. The mine operated by Mark Moore has both a large-scale open pit and a small-scale underground shaft. The stones from this mine are quite stunning, with a range of quality. Today Koroit is unquestionably one of the main boulder opal suppliers in Queensland. Yowah is a small town southwest of Koroit. The name Yowah is from Yowah Creek, where people formed a large horse station in 1872. The small opal field was first discovered around the same time. This mining area is famous for its “Yowah nuts”—precious opal sometimes occurs as the kernel of ironstone nuts. The authors observed both large-scale mechanical mining and fossicking in this field. With necessary supply and food providers, plus the permanent hot spring bores, the town has become a popular tourism and fossicking destination. Heading northwest from Yowah, we arrived at Quilpie. The town was officially granted the township in 1917, while opal was discovered in this area around 1885. It serves as a center for the southern Queensland opal industry and is a gateway to multiple historic boulder opal mines. Mining activities in this field all cluster to the west and north-northwest of the town. Here you can find some of the more productive mines in recent times. 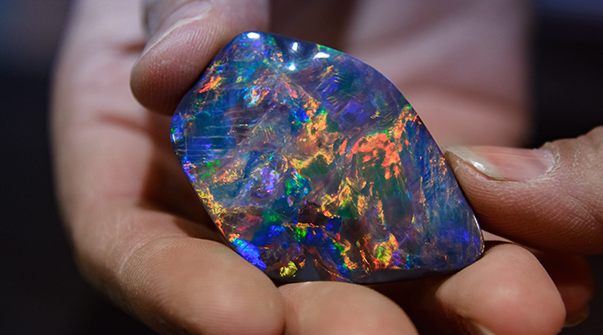 Known as the “home of boulder opal,” the area is the largest producer of this variety in the world. Now, like many other famous opal towns, Quilpie is also a tourist- and fossicker-friendly place. The group visited an opal shop in town and a large open-pit mine north of Quilpie, where the exposed ironstone nuts range from centimeters to over a meter in diameter. The mine owner also cuts and polishes some of their production, and finished product was shown to the authors. Opal cutter and carver Justine Buckley holds a 92-carat Lightning Ridge black opal that she cut. Opal is an amorphous form of silica, and precious opal shows the rainbow colors we call play-of-color, caused by the diffraction of light. Precious opal is rare as its structure is composed of tiny silica spheres tightly packed in a three-dimensional grid. Light is broken up into the colors of the rainbow by the tiny voids between the spheres. To give an idea of the size of the spheres, those that are 0.20 microns have spaces between them that diffract the light to cause a blue play-of-color; 0.25 microns, a green color; and 0.32 microns, a red color. These tiny spheres that are responsible for play-of-color require an electron microscope of at least 30,000X magnification to see them. The Australian opal miners, cutters, and dealers all repeated one important attribute of opal: it is the only stone that can show every color of the rainbow. Our trip focused on the areas that produce black opal and boulder opal, both types of opal famous from Australia. Both types possess a range of appearances; in fact every stone is unique with its combination of colors. 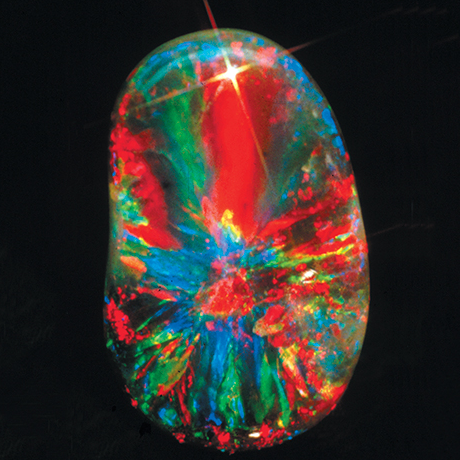 All the members of the expedition found opal to be a captivating if not mesmerizing stone. Black opal refers to opals that have a dark bodycolor when viewed from above. They can be almost transparent to opaque, with an endless variety of play-of-color. Black opal is considered the rarest and most valuable opal. Boulder opal has thin veins of precious opal in the host rock the opal formed in, which is usually ironstone. The opal forms as infillings in the cracks and spaces of the ironstone. Boulder opal is usually cut free-form and wavy to follow the contours of the opal. Add to the appearance equation the pattern of the play-of-color, the underlying bodycolor, the brightness of the rainbow colors, the number of colors, the dominant rainbow colors, the thickness of the seam of play-of-color or color bar, the depth of the transparency, and the shape of the stone, and it is easy to see why each opal is unique and why opal is considered by many gem experts to be the most complex stone to grade. While market preferences determine the values of different opal appearances, opal is truly a personal stone with a beauty that is very subjective. For in them you shall see the living fire of the ruby, the glorious purple of the amethyst, the sea green of the emerald all glittering together in an incredible mixture of light. The striking impression when conversing with Australia opal miners is their fierce sense of independence. These are people who love their freedom and the ability to live their lives as they see fit. All of the miners we spoke to said they could never live any other way. These men and women reminded us of the U.S. cowboys who lived in the 1800s, forging their way west. The hardships and risks involved in their lifestyle seem trivial compared to that of the Australian opal miners. The companies mining opal are really individuals. Often a company is a partnership with just a couple of people working a claim, or in some cases just one person. If there are employees, there are just a few. This is a world of the rugged individual. Miners not only mine the opal themselves but also keep the equipment going, make repairs, and handle everything necessary to maintain the operation. Another factor that drew these people to the search for opal was the thrill of finding beautiful opals. Even with the gamble, the risks, and no assurances, the hope of a major find is strong enough to keep them going through the tough times. One miner explained that there was a four-year period in which he found no opal, and continuing was extremely difficult. Then he discovered a significant pocket of black opal in his mine, and that rush of adrenaline made it all worthwhile. There is no guarantee of finding pockets of valuable opal, and experience and knowledge greatly contribute to success, but perseverance is the key factor—and of course luck. I have known people that have been here for 50 years and never found more than $1,000 and people that have been here for ten minutes and found millions. All the opal miners conveyed this same feeling of euphoria when finding opal. Hope is the universal feeling among the miners—the hope of making the next big find and hitting that pocket of top-quality opal that will make all the hard work and patience worthwhile. Mark Moore mines boulder opal in Koroit from March through November, a couple of months longer than most, as the temperature reaches 48 degrees Celsius (118.4 degrees Fahrenheit) in the summer, heating people and machinery, with constant droughts. In the ingenious and independent spirit of opal miners, Moore has created a comfortable and harmonious environment in the outback. He has a greenhouse for growing vegetables, a water recycling system, and even a couple of bathtubs outside that are propped up so hot coals can be placed underneath to make homemade hot tubs. Many of the miners we met also cut their opal and sell the finished stones as well as rough. Some have even entered the retail business, opening shops in the towns near their mines, such as Lightning Ridge, Quilpie, Cunnamulla, and Yowah. Justine Buckley in Lightning Ridge is involved in not only mining but also cutting the opals, designing and creating jewelry, and even owning a retail store. This mine-to-market approach allows miners to maximize income by catering to wholesale markets as well as tourist markets, depending on which is stronger. In fact several miners we met in the black opal and boulder opal mining areas have adopted this business model. During our trip the free spirit of the Australian opal miners was best envisioned during a visit to Eric Stelzer’s boulder opal mine. Both Eric and his son Colin are avid ultralight pilots. Colin took the expedition group up one by one, flying over the mining area so they could photograph and better understand the nature of the deposit. This flight in the simplest of machines symbolized the uncontained spirit and minimalist lifestyles of the Australian opal miners. Thank you to the Gemological Institute of America for this fantastic article. 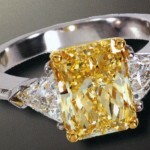 NYCDiamondBlog.com has been chosen as one of the ‘Top 60 Diamond Blogs’ in the world as awarded by Beyond 4 C’s. NYC Wholesale Diamonds will begin featuring our vast Natural Fancy Color Diamond Inventory on our www.NYCWD.com website’s Diamond Inventory Search Engine beginning October 7th. Click here to discover our GIA certified Fancy Color selection including Canary Yellow, Blue, Pink, Green, Red Diamonds of quality and much more! 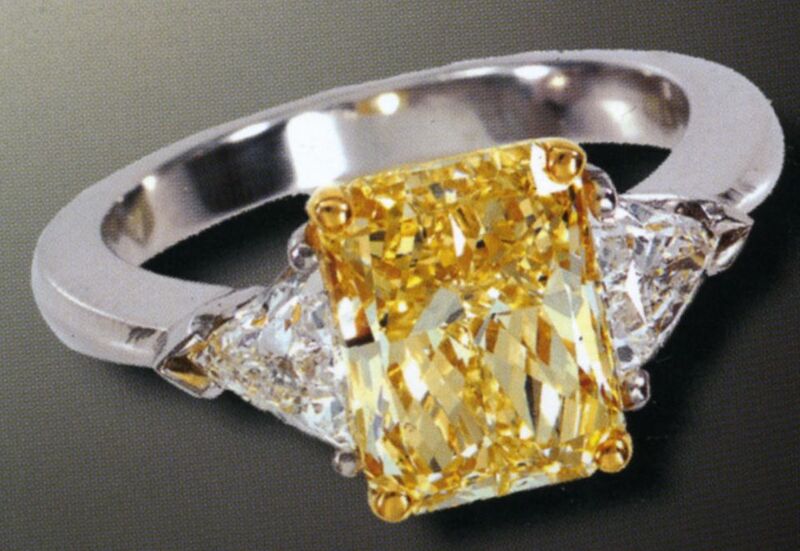 Only one in every 10,000 diamonds possesses natural color and is referred to as a fancy colored diamond. For this reason, these diamonds are purchased almost exclusively for the intensity and distribution of the diamond’s color. Criteria considered when purchasing a white or colorless diamond, such as cut proportions and clarity, are important when purchasing a fancy colored diamond, but color factors become the key characteristics that must be considered. Color intensity, the deepness or richness of color, is the most important consideration when purchasing a colored diamond. 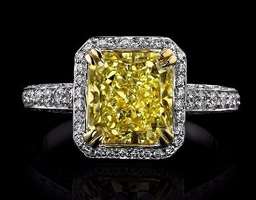 The more intense the color, the rarer and more valuable the diamond will be. All of our diamonds possess natural color and are certified by the as never having been exposed to artificial coloring techniques. 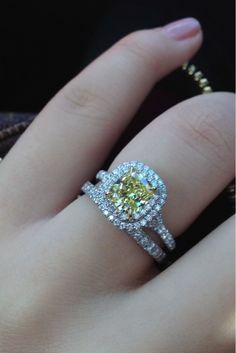 Colored diamonds are primarily cut to emphasize their color. This contrasts with colorless diamonds that are cut to maximize sparkle or brilliance. While colored diamonds still exhibit brilliance, color is the most important characteristic considered when they are being cut. While cut describes a diamond’s light performance, dimensions and finish; shape refers to the overall outline of the diamond when viewed from the top (e.g. round, princess or marquise). 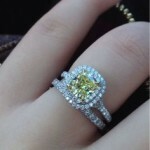 It’s important to note that many colored diamonds are cut into non-traditional shapes to enhance their natural color. Two of the most efficient and beautiful cuts are Cushion and Radiant. Our entire inventory of colored diamonds are independently analyzed and graded by the Gemological Institute of America (GIA), which is the most respected laboratory in the diamond industry. Each diamond is accompanied by a colored diamond identification and origin report. This authoritative report lists the diamond’s specifications including its color grade, and ensures its natural origin. Our new Fall GIA Certified Diamond arrivals up to 8.00 carats are in from Antwerp. Just click here for the Diamond of your Dreams!